Geokettle 2.5 nueva version disponible ~ Business Intelligence y Big Data: ¡Aprende Gratis sobre Analytics! Lo nuevo en GeoKettle 2.5 here. 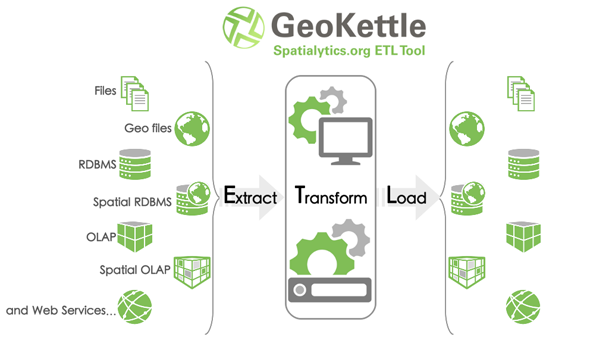 GeoKettle is a spatially-enabled version of the generic ETL tool Kettle (Pentaho Data Integration). GeoKettle also benefits from Geospatial capabilities from mature, robust and well know Open Source libraries like JTS, GeoTools, deegree, OGR and, via a plugin, Sextante. Useful info. Lucky me I discovered your web site unintentionally, and I am shocked why this coincidence did not took place in advance!